Best Face Forward: Happy Halloween! Oh my gosh! 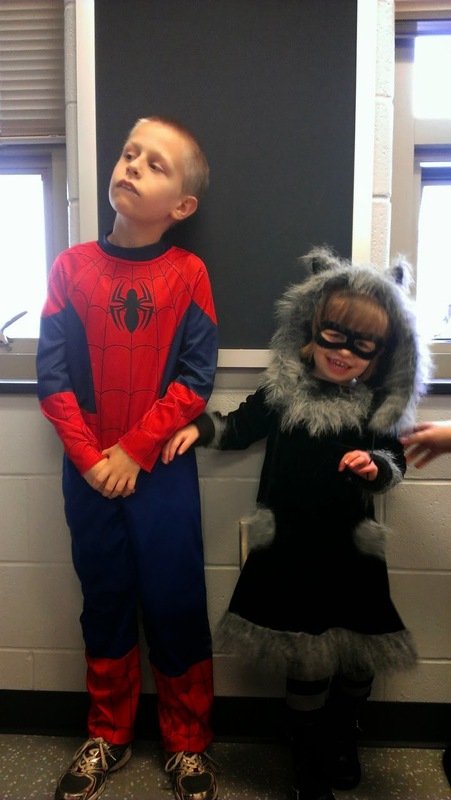 Elizabeth and Johnny's teacher sent me a picture of them on Halloween at school. They are in the SAME picture. Over the past few years, this has become virtually impossible, unless there is an adult using force. Seriously. So, needless to say I was so excited when I got this picture. Below is what I believe they are thinking when this pic was taken. Seriously dude, get her away from me. Is someone calling me from over there? Have I not expressed my dislike for her enough? Now a picture with her-unbelievable. I will never hold her hand, not under any circumstances. Are we good here? I am so over this costume. This is so not fun! I love dressing up and I love my brother! Come on Johnny, let's hold hands.